Prom flowers are a great addition to any prom dress. Pretty and feminine, flowers typically help to accentuate or enhance the color of your dress, and they can act as the perfect finishing touch to your entire outfit. The right flowers can also help make your prom night feel that much more special. Use your own personal preference as a guide as you select the flowers you like best. Probably the most popular of all the prom flowers are roses. They're a classic that looks great with any outfit, and of course, they're romantic as well. Red, yellow, pink, or white roses are all popular choices, but there are also more exotic colors available to go with a unique prom dress. The great thing about roses is that not only can you wear or carry traditional large roses, but miniature roses are also quite popular. Little nosegay bouquets of miniature roses are super-sweet if you're going for a romantic look. Roses also tend to be a little less expensive when prom time rolls around than there are around Valentine's Day or during the summer wedding season. But who says you have to go with popular? If you love sunflowers and have the sunny personality to match, by all means wear a flower that is going to make you happy. Budget, of course, is usually an issue when it comes to teens buying flowers. Florists generally want to make people happy and aren't going to try to sell you flowers you can't afford if you let them know you're on a budget. They can make lovely arrangements with less expensive flowers that you will still enjoy. Most guys don't know much about flowers, and they sometimes don't know where to begin when it comes to picking out prom flowers. If you want to make sure your date gets something nice that actually matches your dress, make sure you talk to him as soon as you've picked your dress out. Let him know what color it is and what you'd like your flowers to look like. 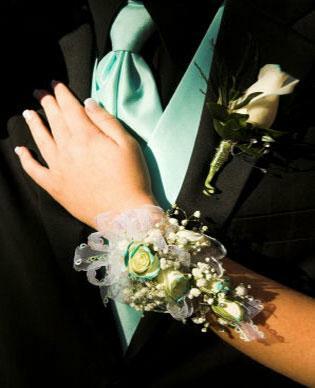 If you know what kind of corsage you want (see below) let him know that too. 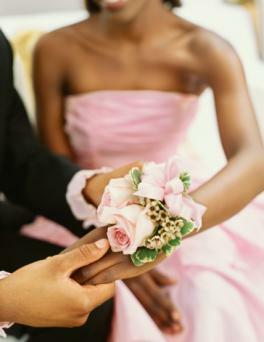 If you really want control over the flowers and want to make sure that your corsage and his boutonnière coordinate, you could always plan an outing to the flower shop together. This gives you an opportunity to show him what you would like, and you can pick out the flowers you want used. You don't get a surprise when you see your flowers on prom night that way, but in this case, that could be a huge positive. It's also important to let your date know if you have a preference for a particular type of corsage. 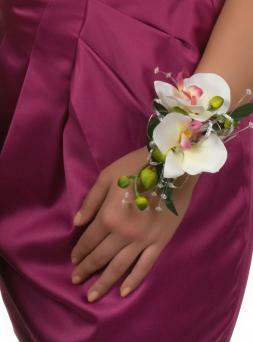 The most popular and readily available corsages are the pin-on corsage and the wrist corsage. Most girls prefer a wrist corsage because there are no pins to mess up their dresses. It's also the best choice when you're wearing a strapless dress, because there is no convenient place to pin a corsage to that type of dress. Another option for prom flowers is a small handheld bouquet, which is really cute in pictures but can get annoying (or abandoned) if you plan to do much dancing. 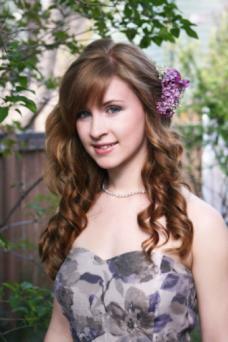 You could also do flowers for your hair instead of a traditional corsage. If you plan to go this route, you'll probably want to buy your own flowers or have your date buy them and give them to you in advance because you'll need them when you get your hair done. Another different but fun choice is to get a corsage that you pin to your evening bag. That way the flowers are in your pictures, but they're not an impediment to dancing and won't mess up your dress. Prom flowers are a great final touch to your outfit. They can be the perfect accessory for a vintage dress or glam up a perfectly modern sheath. Either way, you'll love the pretty scent and gorgeous natural accent they provide to your prom look.